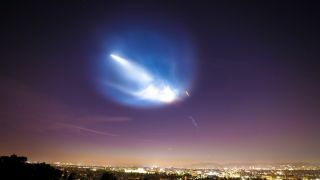 'Definitely Not Aliens': These Photos of SpaceX's Night Rocket Launch and Landing Are Amazing! A SpaceX Falcon 9 rocket launches Argentina’s SAOCOM-1A radar-imaging satellite from California’s Vandenberg Air Force Station on Oct. 7, 2018. The rocket’s first stage came back to Earth for a landing at Vandenberg less than 8 minutes after liftoff. Mike Wall's book about the search for alien life, "Out There," will be published on Nov. 13. Follow him on Twitter @michaeldwall. Follow us @Spacedotcom, Facebook or Google+. Originally published on Space.com.